Of the songs he teaches, only Early Mornin' Rain and If You Could Read My Mind were obvious choices. Some of the others are songs almost nobody plays, but throwing them into the mix is a good thing. Steel Rail Blues and Bitter Green, in particular, are songs that I am delighted are on here, and someday I might tackle them. But, even if drawing only from Gord's Gold, I would like to have seen Song For A Winter's Night, Don Quixote, and Sundown at a minimum. And Pete should have waded beyond Gord's Gold to include Wreck of the Edmund Fitzgerald, the song Lightfoot considers his best (although there are a few other candidates for that honor, including Canadian Railroad Trilogy which would have taken half the video, so I can understand why Pete didn't chose that one). The format of the instruction is excellent, and I assume it is a pattern he has followed in his prior instructional videos (including Jim Croce and John Denver songs). He plays a bit of the song, takes it apart and teaches fretting and right hand technique (but, perhaps revealingly, not for the strummed songs), plays the parts slowly at first and then brings the tempo up to normal. By using the terminology and illustrating visually, his lessons will work for anyone past rank beginner, up to a strong intermediate player. His comments on which fingers he uses for fretting various chords to allow for easy transitions to or from that chord provide useful input to even the more accomplished intermediate player. And there are other interesting techniques and parts he teaches that would be of interest to the advanced player who either doesn't have the ear or the time to figure out out exactly what is being played, or how to play a mixture of lead and rhythm simultaneously. An unexpected bonus is the inclusion of the lead guitar solos on several of the songs, and occasionally incorporating them so that one guitar player can get elements of the lead in addition to Gord's rhythm part. Pete does this on If You Could Read My Mind, playing Red Shea's lead part. This isn't something one expects to get on an instructional video! Very nice, indeed. From his casual comments throughout the video, I conclude that Pete has not attended many Lightfoot concerts; in fact, it wouldn't surprise me if he never attended any. Again, don't get me wrong; I am not saying that the video is flawed as a result. It isn't. But he speculates about Gord's playing technique, and even what parts Gord plays, as no guitar player who has been to a concert would. Pete does, however, actually use his thumb to fret the D/F#, with a comment about how that technique is frowned on by classical players. Of course Gord, and just about every folk and folk rock guitarist from the 60s and 70s plays that way! And in speculating on whether Gord plays the 12 string part in the recording of Early Mornin' Rain, Pete reveals that he hasn't been struck by Gord's driving 12 string strumming, which is both powerful and instantly recognizable. But, Pete is a fingerstyle specialist, and that is where his teaching really shines. He covers Travis style picking, and the interesting pattern that Lightfoot has said he learned from his dentist (the pattern used in If You Could Read My Mind, as well as Beautiful and Softly which are not on the video). He also comments on his use of emphasis on certain beats of the picking pattern to highlight the melody; Lightfoot also uses it effectively to provide a driving beat behind the vocals. The key and tuning isn't always what would be expected. For some songs Pete plays in a different key from Gord, while with others he plays in the same key, which is unusual since one's vocal range generally dictates the key one chooses. And Early Mornin' Rain is normally played in dropped D tuning; Pete teaches it in standard tuning, perhaps to simplify it. He also plays Cold On The Shoulder without a capo; Gord plays it with the capo on the 3rd fret. Again, one can play the song in whatever key one wants, so this is just an observation not a criticism. 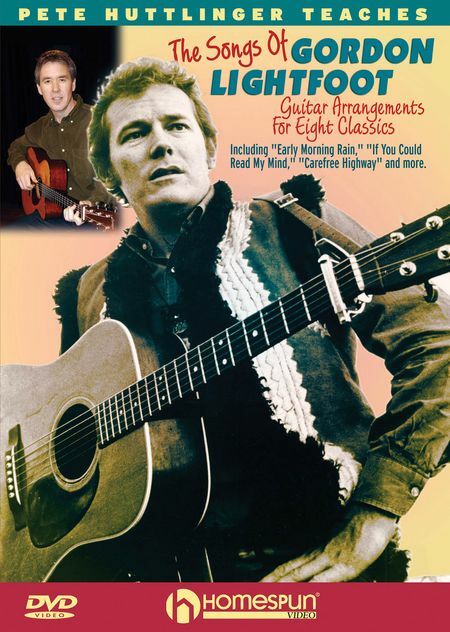 This 2 hour DVD includes instruction for eight songs, from the easiest to the most difficult. The songs are: Early Mornin' Rain, Carefree Highway, Rainy Day People, Circle of Steel, Steel Rail Blues, Bitter Green, If You Could Read My Mind and Cold on the Shoulder. Standard tab notation, treble clef notation, and chord names and patterns are provided in the accompanying booklet. If you have always wanted to learn how to play these Lightfoot standards, but never learned how, this video is definitely for you; plus, you will learn some good playing techniques that you can use when you play other music.